It All Started with Flubber: Summers Off? Happy June, friends! We hope you've made it through the 2017-18 school year unscathed and ready to relax. A few friends, we know, are still in school to make up for days out for weather and efforts to support needed legislative initiatives in many states. Hang in there, you've got this!! We've been hard at work creating new resources, too! Freshly posted in our store is our first classroom decor set - BOLD & BRIGHT - EDITABLE CLASSROOM DECOR! BOLD & BRIGHT because it makes the atmosphere bright and fun; EDITABLE to give you many options to customize this to fit your needs!! 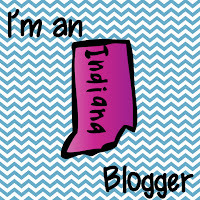 Well, jump on this link and see what all is included! Making your life easier is a prime reason to grab this - jobs, calendars, parts of speech, behavior, labels, desk and locker/cubbie tags, binder covers, and MORE! It's HALF OFF for a few days! 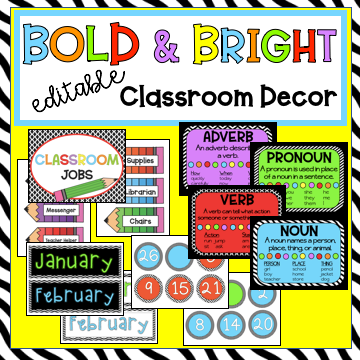 What a deal - 270 pages of editable classroom decor materials for only NINE DOLLARS through June 22! Classroom arrangements, seating options, and decorations are all over Pinterest and it's so fun to look to see what might be the most engaging ways to use our own classroom learning spaces. Do you use a theme? What have you used that's a favorite? Classroom decor and themes are fun, bright, cheerful, and make us smile when we walk in each morning. We hope our BOLD & BRIGHT decor set will bring a smile to many teachers' (and students') faces!